This is a great gift idea for anyone named Timothy. The name is spelled out using the chemical symbols of the following elements: Titanium; Molybdenum; More... Thorium; and Yttrium. The elements are in colorful boxes along with their atomic number and full name. 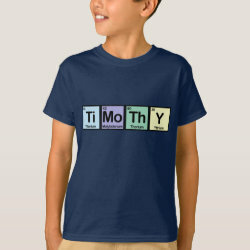 This original design makes a perfect gift idea for Timothys who love science and/or chemistry! Timothy made of Elements Throw Pillow Lumbar 13" x 21"
Timothy made of Elements Post-it® Notes 4" x 6"